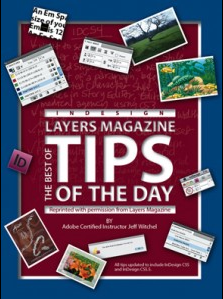 We’re pleased to announce that after writing thousands of tips for Layers Magazine, Jeff Witchel, Ellish Marketing Group Studio Director has compiled his favorite InDesign tips into a book! Introducing The Best of Layers Magazine Tips of the Day. Its pages are jam-packed with the best of Jeff’s InDesign tips, tricks and workarounds as well as undocumented timesaving secrets and shortcuts. Now available as both a traditional printed book and an eBook at Amazon.